There hasn’t been a day in my life when David Bowie wasn’t present. The Rise of Ziggy Stardust and the Spiders From Mars was released months before my birth and was perhaps my mother’s favourite album of all time. She used to play it over and over again in the car when I was growing up and then one day I simply took to playing it myself. It wasn’t just that one album, of course, although today it remains my favourite. I used to revel in singing along to “Cracked Actor” way before I could even begin to understand the darkness in the lyrics and my love of “See Emily Play” predates my love of Pink Floyd (who I first fell in love with at age 8 with the release of "Another Brick in the Wall (part 2)". David Bowie was one of those artists loved equally by my parents. My father absolutely loved Bowie’s mod aesthetics, recalling fondly how he was a mod in his teenage days and how he charmed a bunch of rockers. For my mother, it was the blond hair and blue eyes, the sharp wit and scathing lyrics and that voice, oh that voice. I inherited that particular preference in men from her. By the time it came to give my final English speech in high school, the one that would decide whether I went to university or not, there was no question in my mind as to what the topic would be. With my parents’ eyes brimming with pride, I poured my love of Bowie into a 20 minute speech which was gleefully received by my English teacher. I’ve since come to realise that he was probably a massive Bowie fan too. Years later when the David Bowie Is exhibition hit the V&A in 2013, I realised that far from knowing all there was to know about the man, my high school research had barely touched the surface. I was most interested in the Berlin years and in the complexities of his song writing at the time. I’d always promised that one day I’d delve deeper into who David Bowie was and the art behind his music. While I was making empty promises, Chris O’Leary was embarking on an ambitious project of blogging about every David Bowie song ever written. Starting in 2009, Pushing Ahead of the Dame has become possibly the most successful David Bowie blog of all time. 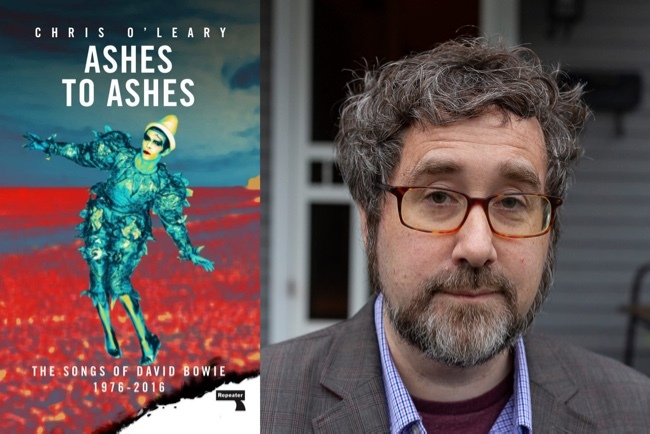 The blog has produced two book deals for O’Leary: Rebel Rebel (2015) covering the period up to 1976 and his latest release Ashes to Ashes (2019) covering the period from 1976 to Blackstar and Bowie’s untimely passing in 2016. At 710 pages, Ashes to Ashes is a massive tome and I can reliably tell you that it will take about two months to read, once you’ve tumbled down the infinite rabbit holes to which the book will lead you. The book begins not with a Bowie album as might be expected but with Bowie’s production of Iggy Pop’s debut solo album The Idiot. It was a fascinating aside to learn more about Iggy Pop. Despite knowing about his connection to Bowie, I knew very little about Pop beyond "The Passenger" and "Lust for Life" and embarrassingly didn’t even realise that Pop first recorded "China Girl". For each track, which would have been published as a separate post on the original blog, O’Leary gives a complete breakdown of the personnel known or suspected to have been involved and the instruments they played. I imagine this is information that the most hardened fan or musically savvy readers will want to know but I soon began to skip over these sections (which are very helpfully put in please-skip-me italics). What was interesting was the story behind each track, Bowie’s creative process and his experimentation first on Pop and later on his own material. Chris O’Leary has a talent of writing about music that many writers (me included) could only hope to aspire to. He really does know what he’s talking about and this makes the book a valuable read for any fan. Despite the obvious mastery, the book is a hard slog to read and I resorted in the end to just reading a track or two at a time, which worked out well as I was listening to each track as I read along. Having read it in this way, I’d suggest the book’s best function would be as an accompaniment to listening sessions, dipping in and out to read in small sessions so that one appreciates the information, rather than simply read from cover to cover. Thankfully, while the book is long, it is by no means dry and O’Leary’s scathing wit brightened up more than one reading session with gems like this: "That said, Bowie and Mick Jagger’s "Dancing in the Street" is still a rotten record for which everyone involved should be embarrassed”. I give Ashes to Ashes an excellent four out of five stars and would recommend it to all fans of David Bowie, especially his later work. As a fan of his earlier work, I'll be seeking out the first volume, Rebel Rebel. Ashes to Ashes is published by Repeater and will be released on 12 February 2019.